This cheese sauce made with Worcestershire sauce and garlic adds savory flavor to dishes. 1. Place canola oil in a saucepan over medium heat. onion, medium, diced	 2 ea. 2. When oil is warm, add onions, cover and cook for 5-10 minutes, stirring occasionally. 3. Add garlic and remove lid. Cook for another 2 minutes. Make sure onions and garlic do not burn. 4. 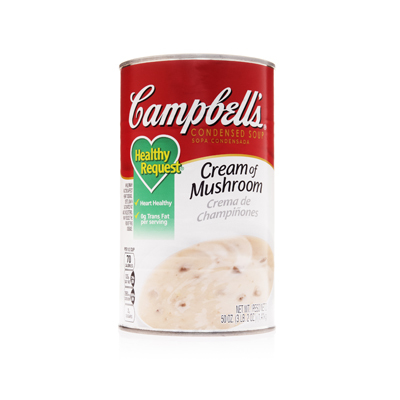 Add in Worcestershire sauce, water, and Campbell’s Healthy Request Cream of Mushroom Condensed Soup. 5. Bring to a boil, then reduce heat and simmer for 10-15 minutes. provolone cheese, diced	 12 oz. 6. Blend mixture and slowly add in cheese until melted. Serve warm. For heartier texture, add sauteed mushrooms to the finished sauce. Add a kick with hot sauce. Serve with chicken breast, over pasta, nachos, melts, turkey, oysters, pork, beef, and as a binder sauce for casseroles.